Detex V40 EB W Battery Powered Weatherized Exit Alarm (9VDC) device option is designed for doors and gates requiring a stand alone, battery powered, alarmed, weatherized panic device. The alarm, with approximately 100dB, will sound when someone attempts to exit, alerting management that an unauthorized exit has occurred. The internal alarm with both remote bypass and remote signaling capabilities is ideal for applications where both security and life safety are a concern. In addition to listing as UL panic and fire exit hardware device, this device conforms to MIL-STD 810F Method 506.4 (driving rain test), MIL-STD 810F, Method 509.4 (salt fog test) and UBC standard 7-2 (positive pressure). 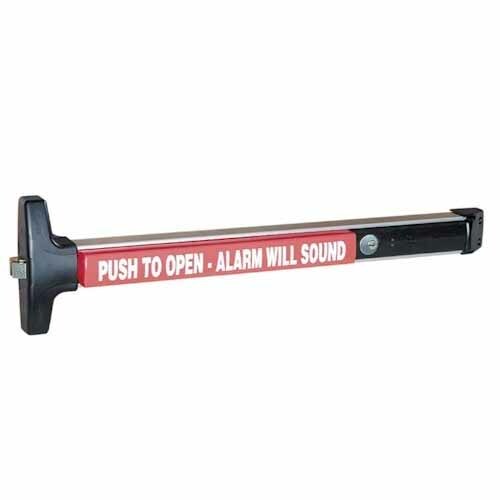 The V40 Series wide or narrow stile rim exit device is secure and durable, Grade 1 panic and fire exit hardware at an economical price. It is designed for use on all types of single and double doors with mullions. The patented mounting plate and strike locator system ensures the easiest and most accurate installation of panic hardware available. Standard V40 Rim Device accommodates wide stile doors, 3” or greater stile, and flush doors. For Narrow Stile doors, 2” to 2-1/2” stiles, specify V40 NS model which provides a 2” longer device and a lower profile strike. Mortise cylinder with straight cam for arming and disarming. • 2” Aluminum doors need to be ordered as a narrow stile (NS)• Door Thickness - Fits standard 1-3/4" - 2-1/4"
Cylinder Length: 1 1/8” (28.6 mm) Number of Pins: 5 pin (drilled 6 pin) Keyway:&..